This is an extract from a peal rung on Sunday, 27 January 2008 in 3h 27mins which was David Brown’s 4000th peal. 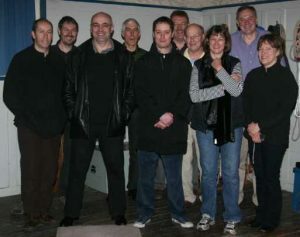 Peal band clockwise from front right: Gillian Knox, George Unsworth, David Dearnley, Mark Regan, David Brown, Simon Rudd, Paul Mounsey, John Loveless, Ian G Campbell, Alan Regin. In December 2012 we were visited by a Devon Call Change band. 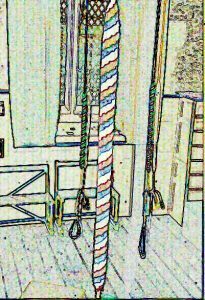 In this piece the back eight bells are rung up in peal, the call changes follow, then the bells are rung down. About 19 minutes altogether.